Pain Manag Nurs. 2013 Jun;14(2):e39-46. 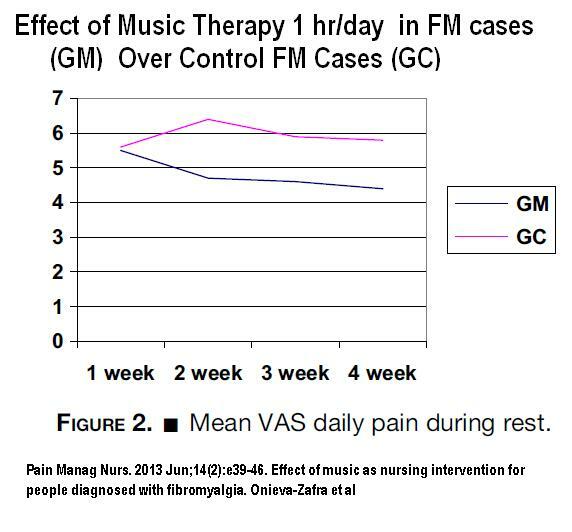 Effect of music as nursing intervention for people diagnosed with fibromyalgia. Onieva-Zafra MD, Castro-Sánchez AM, Matarán-Peñarrocha GA, Moreno-Lorenzo C.
1hour day CD of mixed classical and salsa music. This was a spanish study which might explain the use of cuban salsa music; the other study started with stimulating, then went to slow and ended with moderate pace music. Comment – Some cases of Fibromyalgia are overachievers who give themselves very little time to recover from their day. Music therapy could particularly help here but might be a hard sell. The other music study was 20 minutes twice daily which might be more palatable. Pak J Med Sci. 2013 Jan;29(1):128-31. Music can effectively reduce pain perception in women rather than men. Ghaffaripour , Mahmoudi , Sahmeddini , Alipour , Chohedri .